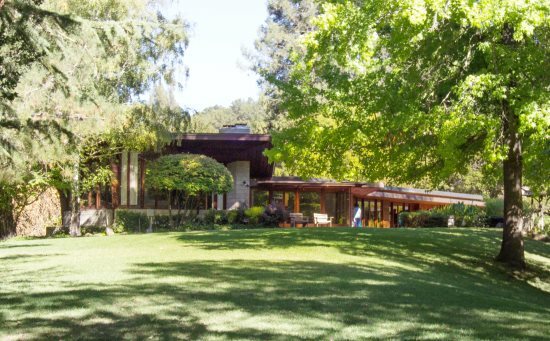 It turned out that a rather complicated issue that came before the Orinda City Council was actually quite simple: the sole problem is that a property on Great Oak Circle is being used for weddings and large parties, giving rise to numerous complaints from surrounding property owners. The council had asked staff to look at the possibility of expanding the requirements for temporary event permits to cover private parties. Trying to find a way to craft rules that would take in the problematic events, staff came up with a complicated two-tier system. 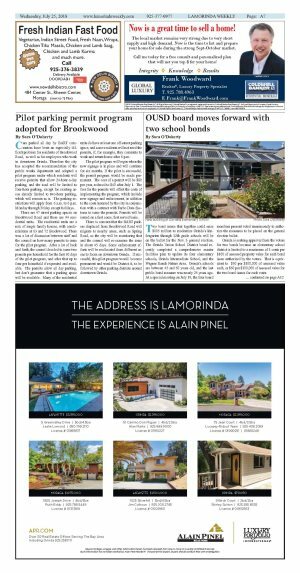 However, the plan was rejected first by the Planning Commission on April 24 and then by the Orinda City Council on July 10, after hearing public comments. Neighbors of the property, which is a 3.5-acre site with a Frank Lloyd Wright-designed Usonian house, told the city council that they felt they were held hostage to these events when 100 people were present, with very loud music being played. Maureen Peratta told the council that she didn't always call the police because she felt sorry for the brides and grooms, but at the same time, her family could not enjoy their home on nearby Moraga Court. "We can't hear anything," she said. "We can't even hear the TV." Michael Boone lives on Orchard Road, a half block from the property. He complained about noise every Saturday night, stating that a fine of "$1,000 is nothing," alleging that the owner of the property was renting it for $15,000 a night. He begged the council to help, and garnered loud applause from the audience. Tim Garlick told the council that the property was featured as a wedding venue in Vogue Magazine, the San Francisco Chronicle and the East Bay Times. He complained about professional disc jockeys playing loud music for six hours straight, from 4 to 10 p.m.
Clint Johnson, also of Moraga Court, told the council, "I'm all for parties," but that he is against this historic landmark site being used as a commercial venue. Johnson, who has been a firefighter for 22 years, said that the events present escape issues and that the people who live on Great Oaks Drive are impacted. The traffic could delay responses to emergencies, he said. He also noted that there are people walking while intoxicated, and perhaps driving while drunk. He believes that the property owners are using nearby church property for parking without the knowledge or permission of the churches. Some speakers said that police did not respond to every complaint. 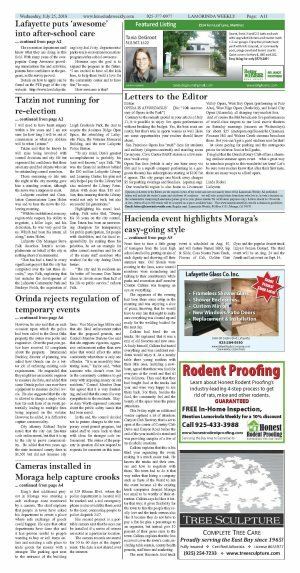 Contacted after the meeting, Orinda Chief of Police Mark Nagel agreed that a loud party complaint might not be responded to when there were more serious events requiring police attention. However, he also said that on each occasion upon which the police had been called to the Great Oaks property, the owner was polite and responsive. Over the past year, police have received 12 complaints about the property. Drummond Buckley, director of planning, was asked how Orinda can do a better job of enforcing existing code requirements. He responded that they might use an acoustic engineer to measure decibels, and added that some Orinda police cars now have equipment to measure decibel levels. He also suggested that the city is allowed to charge a single violation for each hour of an event, potentially leading to multiple fines being imposed on the violator. However, he added, it is difficult to capture commerciality. City attorney Richard Taylor noted that the city can fine-tune code enforcement, but that it is up to the city to prove commerciality. He added that two years ago the state increased county fines to $1,500 but did not increase city fines. Vice Mayor Inga Miller said that she liked enforcement rather than the proposed permits, and Council Member Darlene Gee said that she supports vigorous, aggressive enforcement rather than new rules that would affect the entire community when there is only one offender. "It is an incredibly frustrating issue," Taylor said, "when someone who doesn't even live in the community continues to get away with imposing misery on our residents." Council Member Dean Orr agreed that it is very frustrating, and said that the council is very sympathetic to the residents. Mayor Amy Worth expressed concerns about the public safety issues that had been raised. In the end, the council decided not to pursue changes to the temporary event permit program, but asked staff to come back to them with ideas for stronger code enforcement. The owner of the property in question did not respond to requests for comment on this issue.